An Old-Timer, Yes, But Still Plenty Foxy. Lakewood's Woodbrook Hunt Club is the oldest establishment of its kind in Washington State. 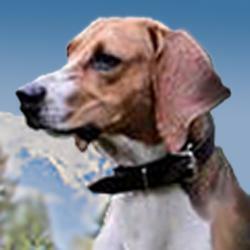 Meet Frasier, exemplar of the noble foxhound breed. Bit like a beagle on stilts. No worries, animal lovers. No fox is ever put in peril by the Woodbrook Hunt Club. Their hounds track scents ONLY. In less than two years, the Woodbrook Hunt Club will celebrate its centennial, making it one of the longest-lived such clubs in America--and one of the oldest continually-operating organizations of any kind in Lakewood. But advanced age doesn't necessarily lead to a sedate, sedentary lifestyle; certainly not in this case. Quite the oppposite, in fact. The air around the Woodbrook kennels regularly crackles with electricity, the kind generated by crowds, excitement and anticipation. Its source? Perhaps one of the last activities you'd expect to find taking place next door to a modern millitary mega-base like Joint Base Lewis McChord: a jolly old fox hunt, by gadfrey! Men, women and children, all resplendent in bright red riding habits, all on horseback, charge over the club's acreage. Most of it, by the way, is within the last 3% of Pierce County where the original prairies, once stretching from far north of the Lakes District to far south of the Nisqually Delta, are still to be found. For more information on how the tradition of the hunt is being preserved and practiced right here in our own backyard, be sure to visit the Woodbrook Hunt Club's website.